In Joys of Spring, winter has lost its icy grip and the new life of Spring blooms forth. The winter birds are still hanging around, but are joined by visitors who have spent the winter in better weather down south. every Spring I make sure the feeders are full to welcome them home for the summer. Soon it will be time for them to make a nest and raise a family. I hope you enjoy these feathered blessings and they bring joy to your home. This image is the second in the Joys of the Seasons Series. Tidings of Comfort and Joy was the first in the series and was near "sold out" status before the second in the series was released. 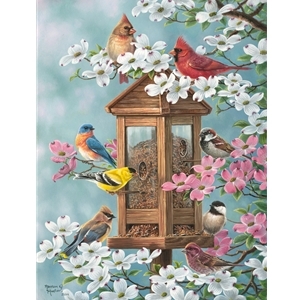 Enjoy these beautiful songbirds in all four seasons when you collect the entire series.